The Yankees faced down a sweep today by the Chicago White Sox. Two top notch pitchers entered into this for what would have figured to be a low scoring pitching duel. The game was not that at all. Mark Beurhle, just two games removed from his perfect game, faced C.C. Sabathia a former Cy Young Award winner. Both players got shelled early and the offense for both teams was prolific. Melky Cabrera hit for the cycle in this game. 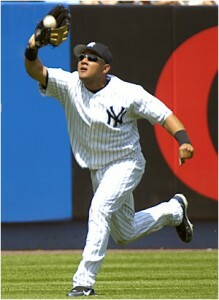 Needing just a triple entering the ninth inning, Cabrera swatted the ball into right field and ran with all out effort to secure the triple. Upon being safe at third he jumped and clapped his hands and yelled in celebration. His teammates clapped and cheered from the dugout as did the approx. 30% Yankee fans in attendance. The Yankees end up winning the contest 8-5 with 15 hits vs. the White Sox 11. Sabathia gets the win and improves his record to 11-7. Beurhle gets the loss and falls to 11-5. The odds makers had the Yanks slightly favored in the one with a -148 money line. That made the White Sox a +128 slight underdog and the total was set at 8.5 runs.